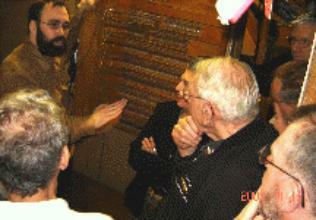 Dave Martin explains the Barton Organ features to the Michigan Chapter O.H.S. members assembled at the Redford Theatre. 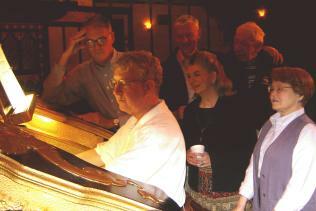 Brian Sweetman presents his Theatre Organ contribution as Leonard Feerick and MaryAnn Balduf enjoy the score. 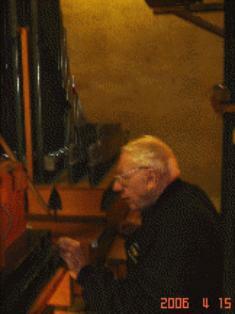 Steven Ball adds his considerable Theatre Organ talent to the demonstration. Leonard Feerick checks out the Barton works in the stage left chamber. MaryAnn Balduf plays, Henry Aldridge pulls stops while Terry Jankowski and Brian Sweetman enjoy the sounds. 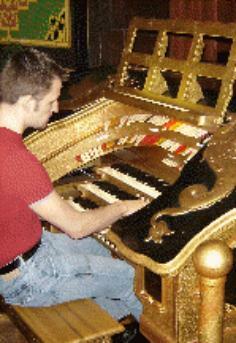 The April 2006 meeting of the Michigan Chapter of the Organ Historical Society was called to order at 9:45 a.m. at the Redford Theatre in Redford, Michigan. Present were Henry Aldridge, Carl Balduf, MaryAnn Balduf, Steven Ball, Leonard Feerick, Diane Hiltner, Terry Jankowski, Edmund Price, Brian Sweetman and James Wilkes. Acting President Carl Balduf asked for approval of the minutes of the February meeting, as printed on the Michigan Chapter Web site and provided as printed copies at the meeting. A motion to approve the minutes was made and seconded and the motion carried. New Business was taken up with a discussion regarding election of officers. It was moved and seconded that Henry Aldridge be the recipient of e-mail nominations for President, Vice President and Treasurer. Nominations will be closed and an election, via anonymous postcard ballots, will be held in time for the May 13 meeting if possible. The procedure as stated was moved and seconded. The motion carried. The meeting was adjourned at 10 a.m., followed by a demonstration of the Barton Organ (listen), preceded by a brief lecture about the Barton Organ by David Martin, Vice President of the Motor City Theatre Organ Society (MCTOS). This was followed by an inspiring talk by Tom Hurst, MCTOS President, about the saving of the organ and the Redford Theatre itself. Following a question period, members took their turn at eliciting lovely sounds from the Golden Voiced Barton and exploring the stage left organ chamber. With a hearty round of applause, the group expressed its gratitude to Messrs, Hurst and Martin for their hospitality in arranging our morning at the Redford Theatre. After departing the Redford Theatre, a number of members met for lunch at El Nibble Nook restaurant for a delightful Mexican repast. Ed Price offers a rousing circus march, much to the delight of those gathered around. Dave Martin explains some wiring intricacies and demonstrates some of the Barton's " bells and whistles." A checking account balance of $1,632.13, less $500 paid out for sponsorship of David Wagner's recital, stands at $1132.13. .